I don't feel like training. Sound familiar? How many times have you said this to yourself? I've previously posted about the long term effects of training burnout. In this installment, I'd like to address specifically what I see as lacking in many students, especially those that have been involved in the martial arts for some time: inspiration. Inspiration (lit. "in-spirit") is that which awakens dormant faculties within us; we see or hear about something, and that experience touches us in a way that has profound ramifications. But after a long stretch on our chosen path, we forget about our contract with inspiration. The martial arts trainee aspires to black belt. Ironically, the very acquisition of a black belt tends to mark the beginning of the end even in the most ardent student. Although statements like "the martial arts are supposed to be difficult" still holds true, these notions can cause us to lose the vision of excitement and adventure that we originally embarked upon. In truth, any form of resistant thinking will take the wind out of our sails. This also holds true for most type A living conditions. Enduring a hectic daily schedule or constantly working overtime leaves little room for any kind of enjoyment. Gandhi's remark, "there's more to life than increasing its speed" applies here. Most people really need to slow down! I realize this is easier said than done. I believe training hard, enjoying ourselves, and feeling inspired are not only compatible but necessary requirements for the martial path. The only thing more important than being inspired is to be an inspiration for others - a worthy goal in the martial arts if there ever was one. I find that my training is like gravity. No matter what else is happening in my life, I am always drawn back into my training. When I am interrupted in my practice, I take the time to re evaluate what I am doing, and how I am doing it. When I am not training, I am finding ways to improve my training. Thank you, rick - I'm facing a forced interruption of 4-6 weeks (minimum) in my training this spring. Perhaps if I think of it not as ground lost, but a time for regrouping and refocusing, it won't be such a discouragement. Wanderer, worshpper, lover of leaving. Come! Man I put in 8 - 10 hours a day at work and almost every practice I fight with myself to actually show up! Some nights I just want to drive home. Once there I get into the groove and ALWAYS feel better after it's over. I also agree that it's good to take a few breaks here or there. I've actually found that things I struggle with actually seem to fall into place after the break. 4-6 weeks really isn't too long. We all need to re-charge our batteries now and then. It can be difficult sometimes to feel motivated to train ...I find once I'm in the dojo learning something new and/or finally performing a technique well, all the personal issues go away. ...I fight with myself to actually show up! Once there I get into the groove and ALWAYS feel better after it's over. Discipline is just getting to the dojo/dojang. I believe many people share that sentiment. Personally, I've honestly never finished a class that I regretted attending. You're so right. So many black belts drop off the face of the earth when they get their new belt. That will NOT be me. I see it as only the beginning. You don’t Love boats. You love the IDEA of boats, being on the water, the freedom etc. But you don’t see the expensive boat payment, the time it takes to learn to sail, cleaning, repairing, storing,etc. etc. The post went on point out the similarities to the martial arts. People love the "idea" of being a martial artist, but they don’t see they the amount of time, energy, money and even pain it takes to really be a dedicated student. I think the commercialization of the martial arts has created something that never existed during the birth of Modern Karate and Taekwondo – a “recreational” practitioner. For those of us who go beyond this level of dedication, it’s sometimes difficult to grasp that not everyone is as crazy about training as we are. Maybe martial arts are difficult, maybe not...but why do you say they *should* be difficult? In Atlanta, I used to dread going to class. I forced myself to go and was always happy I went, but I really had problems just going--and that was only twice a week! And I had a really good studio...I could just always find "something else" to do. Now I hate missing class. I don't know if that's because I've grown in martial arts, because I'm expected to be there every night (as opposed to "whatever two days you show up"), or because of the environment I'm in, but I'm so glad that I don't dread going any longer. I've had some forced breaks (an injury, having to temporarily train at another studio) and that's been good; these breaks have made me realize how much I really like training. I reach for that on the days I'm "too tired." My commute to class is over an hour one way. But I know once I get on the subway, I'm not going to turn around. I also sort of set myself up on purpose... The first time I had to miss a class (or be late for class), I called Master directly. (I specify directly because many things are done indirectly in this country.) I'm sure I would have been let of the hook for not calling since I don't speak Korean, but I only thought it polite. Since I've set that precedent, I have no excuse for not telling him I won't be there. I hate the idea of having to "call in sick" so to speak unless it's a real, valid reason. The only thing more important than being inspired is to be an inspiration for others - a worthy goal in the martial arts if there ever was one. After nearly 6 months there, I was tricked about a test. Master said to me, "Every day is a test. You come here with a cold, test. You train with [another] studio one month, test. You call me when you're late. Good. Test. Every day. Yesterday, today, tomorrow, here, home. Korean. All." I hadn't thought of it that way; I hadn't known I was being tested. Sometimes there is something to be said for just showing up. Even if I show up and have an "off" day, I've beaten the internal demons that wanted me to crawl in bed and eat chocolate ice cream. That in turn, inspires me. It may be a bit egotistical, but sometimes you've got to inspire yourself. I'm sure you've heard the expression that 1st degree black belts are "serious beginners". Anyway, I like your spirit! I think the commercialization of the martial arts has created something that never existed (before)– a “recreational” practitioner. It's funny, I wrote an article about that a while back. But you're right - the rigors of martial arts training aren't for everyone. The only way we grow (i.e. develop) is through brute necessity. To develop yourself in any endeavor requires hard work, and this is especially true in the martial arts. It doesn't have to be that way all the time, but if your training isn't challenging at some point, hence difficult, something's wrong - and that's irrespective of the rank or skill of the trainee. Still, I believe the inherent difficulty of training should never be at the expense of something that ultimately should give us enjoyment. My commute to class is over an hour one way. I'm sure I would have been let of the hook for not calling...but I only thought it polite. Whenever I was going to be held up for any reason, I always called in. Of course it's polite - and it's good practice. I wonder how many people still do this? Master said to me, "Every day is a test..."
That's the hallmark of a good teacher. It sounds like you're in a good place, Amanda, and I'm sure you know that or you wouldn't bother with a school that takes over an hour to get to. Thanks for stopping by again.
" How many times have you said this to yourself?" around the 3/4 of each session. There comes a time when I'm due for a break. Seeing renshi, I think: Can I one day know all this? Seeing Sensei, I think : Can I ever move that fast? Passion, inpiration and obsession and pretty intertwined. Or so they seem. Blatantly copied from something I wrote here about what it means to train at karate as a martial art. Many martial artists have stated their reasons for studying the martial arts: social atmosphere, exercise, health, self-defense, tradition, discipline, character development, looking cool, etc. Realistically, it is a mixture of some or all of those aspects. Underlying most of these reasons is another: "because it is fun". However, there are many people for whom enjoyment (for any number of reasons as stated above) is a deciding factor for when and how they train. Even if a person states above all else their purpose is to become a better fighter, they may often "not have their heart (or head) in it today" or "just don't feel like it". In these cases, they usually do not train and prefer to do something else. In other cases, people's lives are very busy and there is not that much time to train, or if there is, they would much rather spend it doing something else. To put it in economic terms, they do not gain much utility out of training and therefore perform some other act that gives them utility. What kind of person "gains utility" from training no matter what their mood? A warrior. One warrior, Gurney Halleck from the novel Dune, admonishes the main character Paul Atreides with these words after the latter states he is not in the mood for training: "Mood's a thing for cattle or making love or playing the baliset. It's not for fighting." Chibana Chosin was a real-life warrior. He was known for doing things such as never entering a room before scanning it for potential enemies, even in his own home. If he had such intensity outside of his training, how much more he must have had during it! Herein lies the difference between those who train for fun and those who train for skills. Too many people focus on how much fun they get out of training while they do it instead of how much they value the combative skill acquired. Don't get me wrong, having fun during training is acceptable and certainly helps the effort required for continuous training over multiple decades. I certainly do and recommend it. Yet whenever you feel yourself not in the mood to train, remember what it is you are training for: fighting skills. This is more than simply having "discipline", although it has much to do with it. It is continually making the decision to either be someone who practices karate or a warrior who trains at karate as a martial art. As a side note, my instructor says that Chibana Sensei would never have said something like that (disparaging the current generation of youth back then). Passion, inspiration and obsession are pretty intertwined. Or so they seem. Seemingly. It's that last one you mentioned that needs to be considered. Obsession is actually rooted in fear. Workoholism is a good example of this. ...there are many people for whom enjoyment is a deciding factor for when and how they train. The key phrase here is "deciding factor". As I've previously mentioned, sometimes discipline is just getting to the dojo. It's more than just that, though. The master/disciple relationship has become the merchant/consumer variety. The chief instructor no longer grants interviews for prospective trainees, he has you sign a contract. 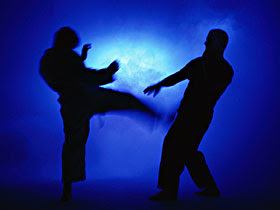 People pay for martial arts, which affects their view of them tremendously. Times have changed. To the modern practitioner the habits and worldview of the old-time master would seem archaic or inane. One could only imagine what Chibana, Itosu, et al would have thought of a McDojo or a camouflage belt.